« IOW: “Art Theater” now in print! Never allow the ne’er-do-wells to impede your own confiscation of C-U Confidential, fresh off the presses and scheduled to be distributed FOR FREE in all the usual and unusual corners of Champaign-Urbana starting this Friday, November 22! Be sure to reference the “Zine of our Scene” Page next week for a list of drop points if you don’t find it right away! We should have realized up-to-no-good (or so we think) creeper Montgomery Joyce would return to our cover-scape and jumble expectations, particularly when in concert with the likes of fashionable contacts Aaron Davidson and Samantha Ducey. It might be wise to direct your gaze towards the much less shady pursuits in our pages, dearest readers! The folks behind Champaign Urbana Theater History furnish our first-ever book excerpt from their release, The Art Theater: Playing Movies for 100 Years, to which we add a brief discussion with Art Theater Co-op maven Austin McCann. We also fork over the scoop on those fall film festivals that have enlightened our region in recent weeks. Your humble editor salutes the late Roger Ebert, relates his experience shooting video for WILL television, dredges up Hollywood’s token production pit stop in the C-U, and introduces our lovely cinema camera models. Of course, we stuff as much newsworthy material as we can onto every inch of every page because you deserve our best! Enjoy this issue and don’t take with a grain of salt our threat to issue once again in the spring! You know what might fuel our intentions? 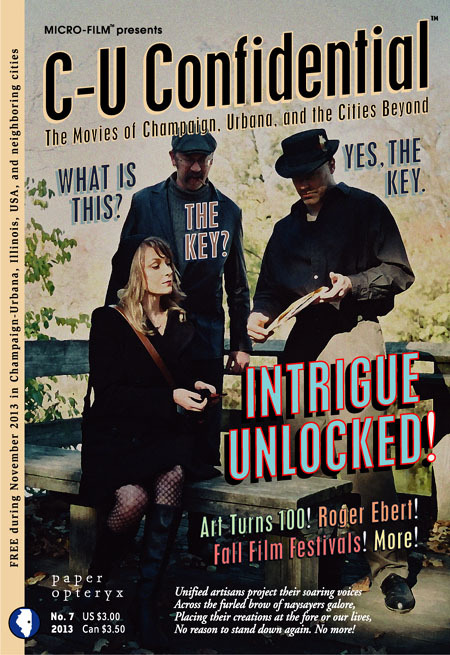 For the third year in a row, we are going to ask you to send in photographs showing us where you find and/or read C-U Confidential; give us fan-made collateral with which to decorate our Internet portals and prove the people of Champaign, Urbana, and the cities beyond are willing to digest a little homegrown film culture now and again. Thanks! p.s. We salute this issue’s advertisers, and you should to: The Art Theater Co-op, Bachelor Pad Magazine, Champaign-Urbana Theater History, Drunken Zombie Film Festival, Embarras Valley Film Festival, Forced Perspective Entertainment, Illinois Film Office, Indi Go Artist Co-op, Kevin Elliott Counseling, Kill Vampire Lincoln Productions, Premier Print Group, Shatterglass Studios, and Sleepy Creek Vineyards. Thanks for your all-around support, agents of Confidential change! This entry was posted on Tuesday, November 19th, 2013 at 2:00 pm	and is filed under C-U Confidential, Print Matter du C-U. You can follow any responses to this entry through the RSS 2.0 feed. Both comments and pings are currently closed. Any way you like it, this upcoming issue of C-U Confidential will give you cause to talk it up.